While pure gold is yellow in color, gold can also appear to have other colors. 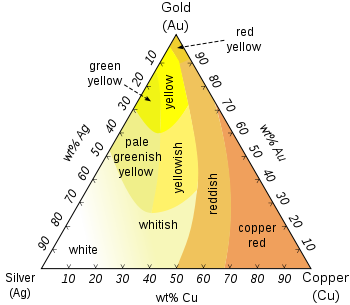 These colors are generally obtained by alloying gold with other elements in various proportions. For example, alloys which are mixed 14 parts gold to 10 parts alloy create 14-karat gold, 18 parts gold to 6 parts alloy creates 18 karat, and so on. This is often expressed as the result of the ratio, i.e. : 14/24 equals 0.585 (rounded off), and 18/24 is 0.750. The most common grades of gold, in addition to pure 24k, are 22k (92%), 18k (75%), 14k (58%) and 9k (38%). There are hundreds of possible alloys and mixtures, but in general the addition of silver will color gold white, and the addition of copper will color it red. A mix of around 50/50 copper and silver gives the range of yellow gold alloys the public is accustomed to seeing in the marketplace. A small amount (0.2%) of zinc can be added to harden the alloy. White gold's properties vary depending on the metals and proportions used. The term white gold is used very loosely in the industry to describe karat gold alloys with a whitish hue. Often rhodium plating is used to enhance the appearance of the base material. The main alloys used in jewelry industry are gold-palladium-silver, and gold-nickel-copper-zinc. About one person in eight has a mild allergic reaction to the nickel in some white gold alloys when worn over long periods. Sun Sun Jewelry uses white gold alloys based on palladium. Rose gold is also known as pink gold. A common alloy for rose gold is 75% gold and 25% copper by mass (18 karat). Since rose gold is an alloy, there is therefore no such thing as "pure rose gold". More information on colored gold can be found on Wikipedia.